Interesting Read: Who Moved My Cheese? 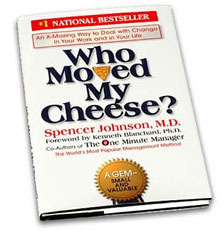 Who Moved My Cheese by Spencer Johnson, M.D. has been around a while but I just got ahold of it over the weekend. One of my aunts suggested that I read it. A little reluctant at first because its so short, I didn’t believe it to have any substance. I started reading it and finished fairly quick – it takes about an hour to read. It offers a test of faith approach on succeeding at just about anything. It highlights the importance of embracing change, and making the best of it. I enjoyed reading it!